Toledo before and after – StampTech Inc. 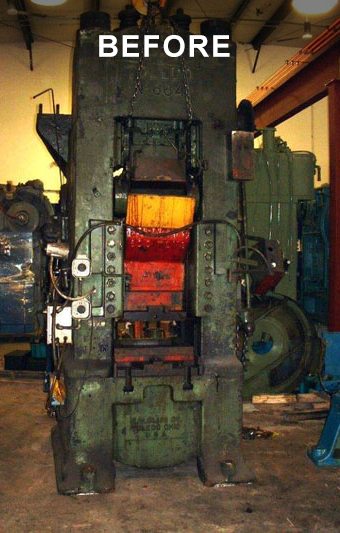 Founded in 1986, StampTech Inc. is a leader in all phases of the metal stamping industry. Our 25,000 square foot facility has full machine shop capabilities — offering a large selection of used, rebuilt and new power presses and accessories. 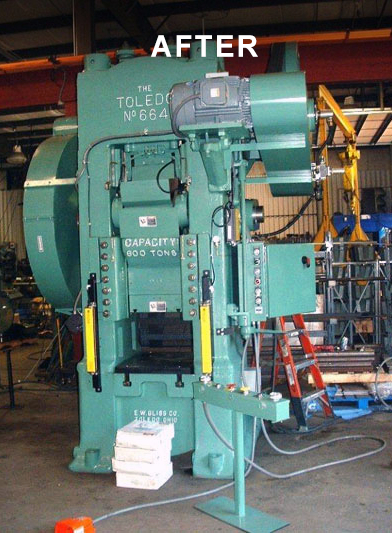 We can upgrade older equipment, rebuild it to the latest machine tool standards, add new OSHA compliant controls — and run, test and inspect it before shipping. Our expert service technicians travel throughout the United States providing field repairs, press inspections, OSHA upgrades and installations — and are available 24-hours a day. StampTech service vehicles carry a large inventory of parts to keep your equipment running. Recognized for our systems capability — we can provide a complete turnkey system including tooling and runoff at our facility, prior to shipping. Our corporate office, rebuilding facility and showroom is located in Southington, Connecticut, just 30 miles from Bradley International Airport in Windsor Locks. Remarks : Customer had an 80 year old full revolution press ready for the scrap yard. We made (in house) a new crankshaft to accept a Minster air clutch to give him a new OSHA compliant rebuilt press good for next 80 years!